Gym memberships can be a great investment for some people, but many people prefer the convenience and flexibility of being able to exercise at home, especially when it allows them to save money as well. Home multi gyms are especially popular in the UK as they pack a wide range of exercising options into a small space and affordable price. If you’re in the market for one, check out this guide before you part with your cash. There are really only three basic factors to consider when looking at home gyms. Safety is obviously a given, but comfort matters a lot too. Let’s be honest, the average person is going to be a whole lot more likely to use a home multi gym if they’re comfortable rather than uncomfortable. With that in mind, there are two points to check. The seat – In all seriousness, you want a seat (or bench) with a decent level of padding. Ideally, anywhere else you’re body touches (e.g. back rests, ankle rests), should also have some level of padding. The pulley system – It is basically impossible to overstate the importance of a good pulley system which runs smoothly and allows you to focus on the exercise rather than getting the weights to do what they should do. As you can’t tell this from online pictures, we strongly recommend checking reviews such as ours. Obviously one of the major benefits of multi gyms is that they not only allow you to use weights, but are set up so that you automatically use the weights safely without giving the matter any further thought, whereas with free weights you often have to think about what you are doing, at least until you have formed good habits. If you are really serious about fitness, then you may want plenty of support for weights, but if you just want to develop and/or maintain a decent level of all-round fitness then weights may be less important, especially when you remember that good resistance systems can double or triple the impact of the actual load. Having less weight support may save you some money and potentially increase your options for siting your new home multi gym. As a minimum, you probably want to look for the following exercises. You may also want a preacher curl pad, which is great for working your biceps. Even a basic, entry-level home multi gym will have these (except possibly the preacher curl pad) and as you move up the price range, you’ll generally find that there is an increase in the number of exercises your home multi gym can support. We’ve rounded up what we think are the ten best home multi gyms in the UK, based on the value for money they offer. We’ve aimed to cover both the premium and the budget ends of the market with plenty to choose from in the mid-range. All our picks are good quality and safe machines we’d be happy to use ourselves, the differentiator is basically the level of functionality they offer (which is, of course, closely linked to their price). 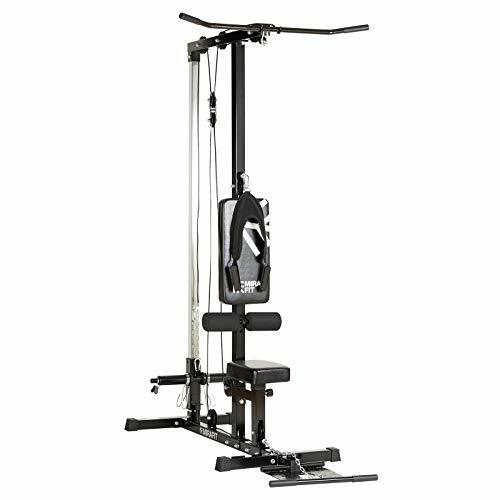 The BH Fitness G152X Global Multi Gym with Leg Press has been designed on the assumption that it’s going to get some serious use and needs to be able to stand up to it, which is why the build quality is so impressively robust. For example, the 165 lbs solid vinyl weight stack is lifted by means of high tensile 2000lb aircraft cables, so you can never have any doubts about safety. The lifting mechanism itself uses a series of pulleys for maximum smoothness and hence comfort. In short, this is one of the very best home multi gyms on the UK market. The Bodymax Fitness Strength Trainer is all about value both for money and for space. Although it’s priced in the mid-range, it hasn’t compromised on build quality being crafted out of a combination of heavy duty 3″ x 1.5″ box-section steel and 2″ heavy-duty tubular steel. Even though it’s one of the most compact home multi gyms on the UK market, it can still work all major muscle groups (including arms, legs, chest & core) and enough exercises to stop you getting bored. 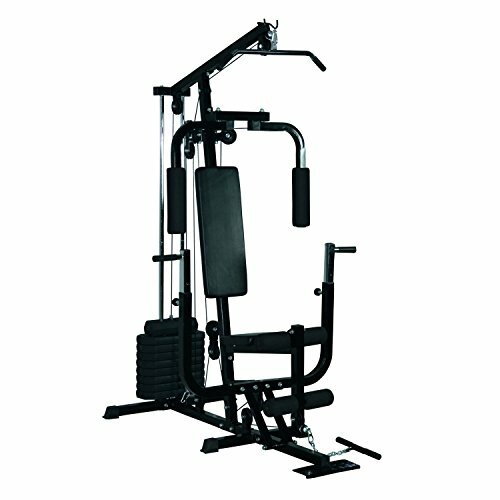 If you’re tight on space and/or budget, then the F4H Olympic 7080 Multi Gym could be just what you need. We should say up front that it isn’t the best home multi gym in the UK when it comes to putting it together, you’ll need patience and a decent tool kit, but you’ll end up with a very robust home multi gym (made of solid, rounded tubular-enforced steel) with a decently-padded seat and box pad. While the range of exercise options on the F4H Olympic 7080 Multi Gym is less extensive than with some other options, it is still enough to target the major muscle groups. The FIT4HOME Unisex Professional Home Gym is a mid-priced home multi gym which ticks all the right boxes in terms of safety (powder-coated steel frame with 1.5 mm main tube thickness), comfort (foam-padded seat and backrest plus foam ankle rests) and features (targets all the major muscle groups, see the full list of features below). It also has a rather less usual feature in the form of a punch bag which holds 20Kg of sand. This opens up lots of interesting possibilities for upper body training, even if you’re not into combat sports. Hi-density foam padded seat and back rest, Comfortable foam ankle rests. Homcom is a company which specializes in affordable, small-space solutions. Their products aren’t necessarily the easiest to build so you need to be prepared for that, but they are manufactured to decent standards. For instance, their multi gym has a tubular-steel upright frame with black coating and a protective cover around the weight plates for added safety, plus a good level of padding on the seat and backrest. It’s perfectly capable of delivering an effective work-out for the major muscle groups and is a very affordable alternative to the gym. Bench press, chest press, lat pulldown (front and back), pec dec, leg extension, back leg curls, upright rows exercise functions. 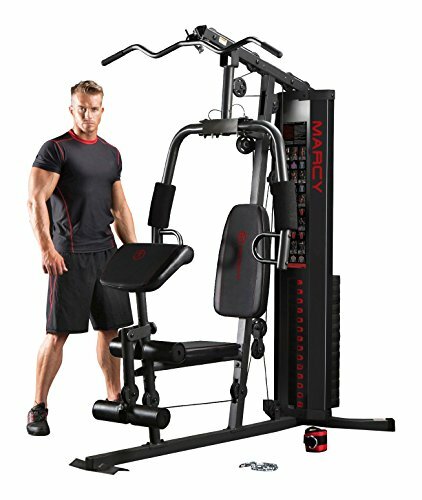 The basic idea behind the Marcy Eclipse HG3000 Compact Home Gym is that it squeezes the essentials of a high-quality home multi gym into the smallest possible space without compromising on build quality (or user comfort) and for a very reasonable price, considering everything it offers. It may seem like a small detail, but we really liked the fact that the Marcy Eclipse HG3000 Compact Home Gym has an exercise chart on the back of the frame, so everything you need is in one place. This really is one solid little workhorse. 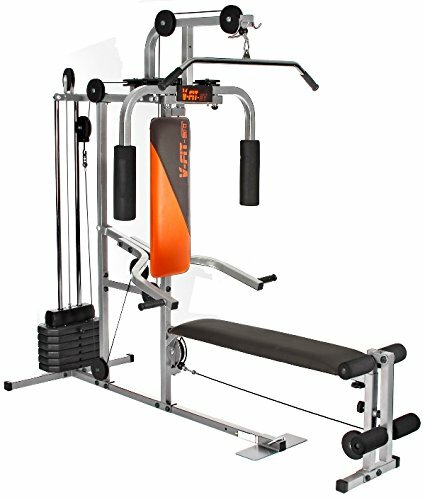 The Marcy MKM-81010 Home Multi Gym is essentially a high-quality, mid-priced home multi gym which requires a bit more space and money than alternative mid-range options, but compensates for this by squeezing in some premium features, like the bio-mechanically-friendly leg developer, and some very convenient design touches, like the way you can adjust just one pin to convert the chest press into a seated row. Plus there’s a striker-plated foot plate on the low pulley system to keep you firmly on the ground while you do your rows. 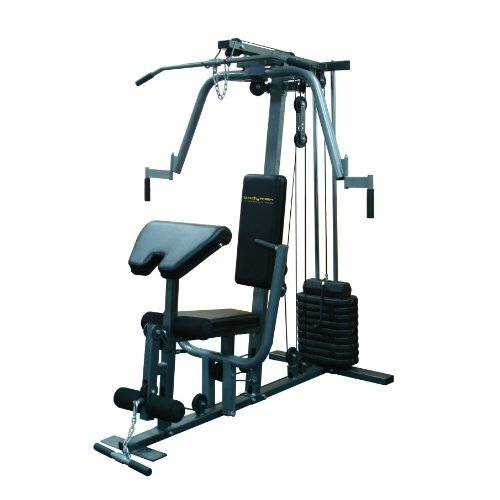 There are two main reasons why the Mirafit Multi Gym Lat Pull Down Machine retails at such an affordable price. The first is that if focuses purely on the essentials and the second is that it comes without weights, but that does mean you can add standard 2.5CM/1″ weights as you need them. Total supported load is 180Kg with a maximum weight load of 100Kg and a maximum user weight of 120Kg. While this is very much a “bare bones” home multi gym, the build quality is very robust and the pulley system is both smooth and reliable. The V-Fit LFG2 Herculean COBRA Lay Flat Home Gym will appeal to people who want the proper “benchpress” feel you get in a commercial gym. Obviously, when it’s in use it needs a bit more space than your standard “sit-up” home multi gym, but the bench folds up out of use, at which point it becomes relatively compact. Another couple of plus points is that you can switch between exercises without having to mess around with cables and that most of the weight is delivered as resistance so the machine itself stays fairly light for all it’s very robust. If you’re really short on space and/or budget but you’d still love to have a home multi gym, then the Wonder Core 2 might be your best option. Obviously, it’s more limited than the proper home multi gyms on our list but it can still give you a pretty thorough workout targetting all the major muscle groups and you can get around the lack of support for weights by using weighted arm/leg bands. The Wonder Core 2 support 12 different exercises and some of them can give you a fair bit of cardio to go along with your muscle training. Double the resistance of the Wonder Core 2's original rowing set. Improve your strength, fitness and muscle tone even further. As your strength and fitness increases, Wonder Core 2 grows with you to help you keep improving. As is generally the case, it’s impossible to pick a definitive winner, basically the best home multi gym in the UK is the one which best suits your needs and this will depend on what you need and want and, of course, how much you are able (and willing) to spend. 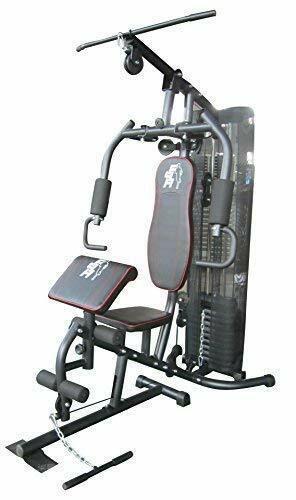 If you really want that “gym feel” at home could look at the BH Fitness G152X Global Multi Gym with Leg Press or the V-Fit LFG2 Herculean COBRA Lay Flat Home Gym. The former is very much a premium option and priced accordingly. The latter is more limited but its “lay flat” format does replicate the standard practice in an average gym. 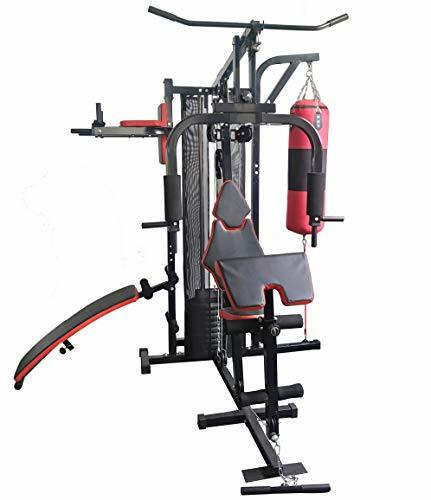 If you want to combine standard gym training with some degree of combat-sport training, then you might be interested in the FIT4HOME Unisex Professional Home Gym, Black/Red as it comes with a punchbag and so gives you everything you need in a fairly compact package and for a very reasonable price. 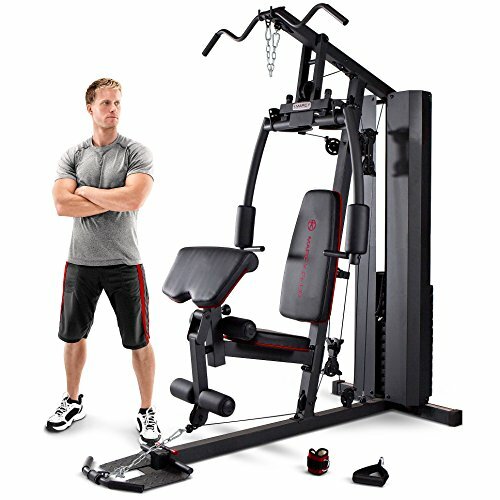 If you’re on a really tight budget, you could look at the HOMCOM Multi Gym Workstation Home Workout Station or even the Wonder Core 2 Unisex and if you’re in a really tight space, for example, a city studio, you should definitely take a look at the latter before you decide whether or not you really want to pay up for gym membership. For everybody else, each of the mid-priced gyms have their own characteristics and the choice between them really is largely a matter of taste and how you perceive their value. You can, however, rest assured that you will get a very decent work-out in the privacy and convenience of your own home and almost certainly save a lot of money compared with gym membership.